Ethan Stewart & Catherine Rigg were married at Hiles Blvd in New Smyrna Beach on Friday July 15th 2016. It was breezy, warm and perfect! This photogenic and lovely couple had live violin player and a super sweet setup with 40 or so attendees. And you can tell by the photos how much love was flowing that day. Another amazing set of families. 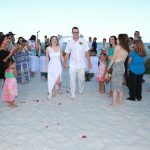 The couple chose the Maya four post bamboo arch with white tulle and 36 chairs with white covers and burlap sashes, standard photography, ceremony music, and sea life aisle way markers.